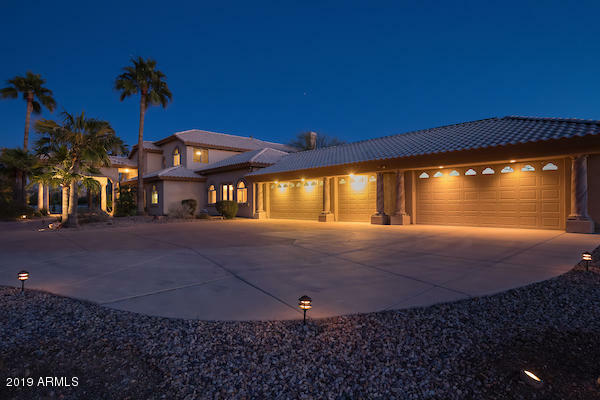 Simply elegant 6,224 sq ft gated estate with 4 beds & 4.5 baths on a large lot of 3.3 acres in Mesa Del Oro Estates with Superstition Mountain Views. Entertainer's home with salt water pool & pool house with bar & sauna, tennis & sport court, built in BBQ, synthetic grass, & 3,000 sq ft covered patio. Gourmet kitchen features granite countertops, 42'' upper cabinets, sub zero fridge, Dacor double ovens, range, & microwave. House features formal dining room, great room with wet bar & fossil stone gas fireplace, & family room with 2nd fireplace. West wing downstairs features amazing media/theater room & guest bedroom/office with bathroom. Staircase leads to huge master suite with private balcony, his & her walk-thru closets, & gorgeous master bathroom with double sinks, separate shower, tub with jets, & private toilet room. 2 guest bedrooms also upstairs. House has N/S exposure, tinted windows, surround sound system, 5 car garage, RV gate & parking, & allows horses. Owned solar system! Furniture available on separate bill of sale. No HOA. Come see this marvelous desert estate!